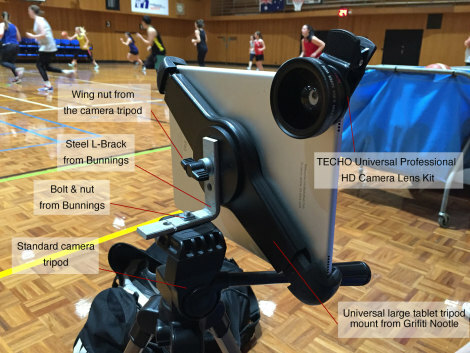 This post details the setup required to film sport and upload to YouTube using an an iPad circa May, 2016. $1,400 Apple: 256g 9.7 inch iPad Pro (or $899 for 32g). ~2 week delivery time including engraving. 67 Grifiti: Nootle Universal Large Tablet Tripod Mount. ~2 week delivery time from overseas. In 2016, our basketball association (Big V - Victoria, Australia) mandated that all our home games are to be uploaded to YouTube in high definition - at least 720p, preferably 1080. Here is our YouTube channel of these games. Hopefully some of these details will help others out because it took us a very long time to work out all the quirks. Given that video recording for us is performed by untrained family and friend volunteers provided by our players, we wanted to make the filming and upload process as simple as possible and assumed that an iPad would best facilitate this. Our preference was for a volunteer to be able to easily film the game and then upload the footage directly to YouTube from the same device and that the filming interface be as intuitive as possible. Given the user-friendliness and high definition camera on iPads, we decided to purchase a 9 inch 116gb iPad Pro. The Pro model has a faster processor and better camera (4k definition vs 1080p) then other iPads which make it better suited to video recording and processing. A Big V basketball game that goes for 1.5 hours seems to use around 13g of memory and so the larger memory model allows us to store more games. This is particularly useful given that we often forget to delete old games before filming commences. Because the camera lense of an iPad films in a fairly narrow angle, we also experimented with several wide angle lense attachments and ended up finding a good solution with the TECHO Universal Professional HD Camera Lens Kit. Without a wide angle lense attachment, the iPad video camera does not satisfactorily capture enough of the court to make the footage watchable. Additionally, we required a way of mounting the iPad on a traditional tripod and found that a Grifiti Nootle universal large tablet tripod mount worked well in conjunction with an L-bracket and a nut & bolt from bunnings. This camera mount expands via stretching and so would also suit a 12.9 inch iPad. The L bracket is neccessary because otherwise a standard camera mount will have the iPad facing the ceiling. A standard tripod wing-nut or bolt will fit in the Grifiti Nootle tripod mount and it's also a good idea to have some extra nuts and bolts on hand in case one gets lost during setup/packup. We have been successfully recording our game footage in this way however we experienced many gotchas along the way and we have not determined a way to upload to YouTube directly from an iPad and so for the time being, the benefit of this setup over and above a standard video camera + tripod seems negligible. One of the key criteria for us was to try and make the upload process as simple as possible. We assumed that the iPad Photos app was going to allow us to upload game footage directly to YouTube using the share button. Unfortunately, this is not the case and none of the software that we have tried on iOS allows direct uploads to YouTube for videos longer than 15 minutes - we have tried the Photos, iMovie and YouTube apps and also tried to set up live streaming and direct upload from the safari web browser with no success so far. This appears to be a YouTube restriction from iOS devices and any advice that can be offered via the comments on this page would be greatly appreciated. As a workaround, we are currently transferring the game videos from the iPad to a computer (~10 minutes) and then uploading them directly to YouTube (~1 hour depending on your internet connection). Prior to upload, we are now also experimenting with using handbrake to reduce the file size (eg. from 13g > 3g) so that the upload is faster however handbrake also takes quite a long time (~40m ??) to process a 1.5 hour video. This would be quicker if you choose to upload in a lower definition (ie. < 720p / 1080), however you will probably regret that later on when you go back to watch it. Overall, uploading sporting footage to YouTube is a very unsatisfactory experience and we would love to know how we could speed this part up - feel free to comment on this page. Refer to the form posts below for more details. We have had several occasions where the iPad didn't have enough memory to film a full game. In order to free up memory, old games need to be deleted both from the iOS Photos app AND THEN AGAIN from the 'Recently Deleted' folder in the Photos app in order to actually free up the memory. We have found the battery life of the iPad Pro to be pretty satisfactory regarding filming sport. Generally we find that ~30% battery will give us 3 hours of filming time. Assuming that you won't have the iPad plugged in to a charger when at a sporting event, be sure to remember to try and give it a full charge beforehand. When we initially set this up, we chose to purchase an iPad Air (the new Pro model was not available at that time) and we also purchased an olloclip 4-IN-1 Photo Lens for iPad. This lense works very well with an iPad Air however it does not fit an iPad pro at all. Olloclip advised us via email that their iPhone 6 lense would work with a pro however when we purchased one, that statement turned out to be completely false. As per the youtube clip below, the Olloclip iPhone 6 lense is NOT compatible with an iPad pro. This was a real headache for us. It is possible to get good sporting video footage using an iPad however you need to be careful about how you set it up and you can also expect it to take a very long time to upload to YouTube until (if and when) YouTube decide to make it easier to upload from iOS devices. © Melbourne University Basketball Club 2019. This page was last updated by smoke on April 7th, 2018.